Abby Von Der Rehbrugge of Von Der Linde Kennels got a perfect score winning first prize at the NAVHDA Grand River Natural Ability Test on May 10, 2008. It may have been a cold day in May, but it didn't stop Abby from exhibiting all her natural abilities, her love of the water, her highly tuned need to find the birds and to then track and flush them all were all well proven placing her head of the class or should we say top in the field that day. It was a proud day for her owner and handler Ralf Bothe of Von Der Linde Kennels. Welcome - Faula vom Forstweg! 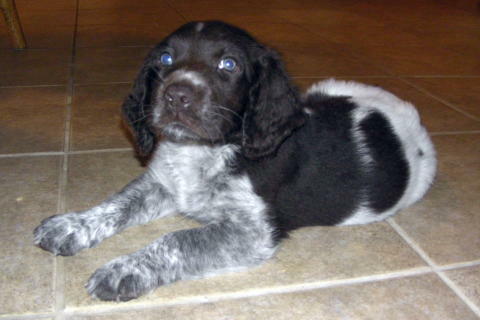 Faula is our newest addition to Von Der Linde kennels. She is 1 1/2 years old and comes with excellent credentials, passing several German Hunting tests with amazing results. We are very proud to have Faula at our kennels and look forward to continuing to provide our customers with premium quality Small Munsterlanders! Check out our Photo Gallery for pictures of Faula! We finally picked our puppy!!! Over the last several months my family and I have had the pleasure of getting to know the Bothe family. We placed a deposit on a puppy earlier this year and then waited for B-Litter to happen. When we returned from our summer vacation we were excited to hear that Ikka was expected puppies. With the patience of my family (and the Bothe's) we visited the puppies several times and conducted puppy aptitude tests (PATs for short). When all was said and done, my wife, son and I came to consensus on which puppy to pick. This video is dedicated to Von Der Linde's Blazing Bauer, to the kindness of the Bothes, and the fun we had choosing. This video was taken last weekend as we played with the puppies. At 5 1/2 weeks old they're already attentive, very playful and interested in retrieving. Good news! Ikka gave birth to 9 puppies - 4 females and 5 males. 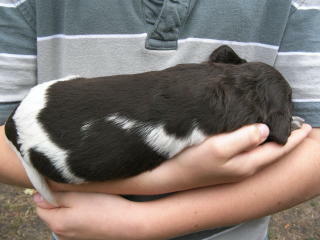 Watch a video of the 2 1/2 week old puppies!